Small boy returning with a bundle from a pawnshop. Circa 1900. Created in 1887, Sherlock Holmes was undoubtedly a product of the sooty, noisy, cobbled streets of Victorian London. His first readers would have easily recognised the city through which Holmes and Watson hailed hansom cabs to chase down vile villains and solve complex crimes. So realistic, in fact, was the London that Arthur Conan Doyle crafted for his characters that many early readers were convinced it was a work of non-fiction. Doyle managed seamlessly to weave his protagonist – famous as much for his weaknesses as his strengths – into a city of similar stark contrasts. Victorian London was a city of intense differences. The expansion of the British Empire, blossoming technologies and burgeoning economics led to an expanding – and wealthy – cosmopolitan city. And yet, concurrently, there lay extreme poverty, homelessness and disease. In a space of 50 years, from 1850 to 1900, London’s population had grown from just over 2 million, to 5.5 million. The rich lived in opulently decorated houses and enjoyed the fruits of the industrial revolution, while the poor were ravaged by typhoid, cholera and living in overcrowded, squalid homes. This messy, conflicting city was the perfect backdrop for the adventures of Sherlock Holmes. He glides through these divided worlds of rich and poor, consorting with kings as much as conniving with street urchins to sleuth out the truth of a mystery. The yellow fog, dusty air, street sounds, foul smells and characters both good and bad in Victorian London can all be found at the very heart of Sherlock’s stories. Using one or more of the objects shown below as inspiration, write a poem that encapsulates and encompasses Victorian London, invoking the sights, smells, sounds and dilemmas of the complicated city through which Sherlock would have stalked. You could explore a modern view of Victorian London and how the challenges of poverty and homelessness still affect today’s city. You could take the role of a Victorian gentleman as he walks down passageways of the streets he knows. You could write in the voice of Sherlock or Dr Watson. Your poem can be about Victorian London generally or Sherlock Holmes specifically. It’s up to you. 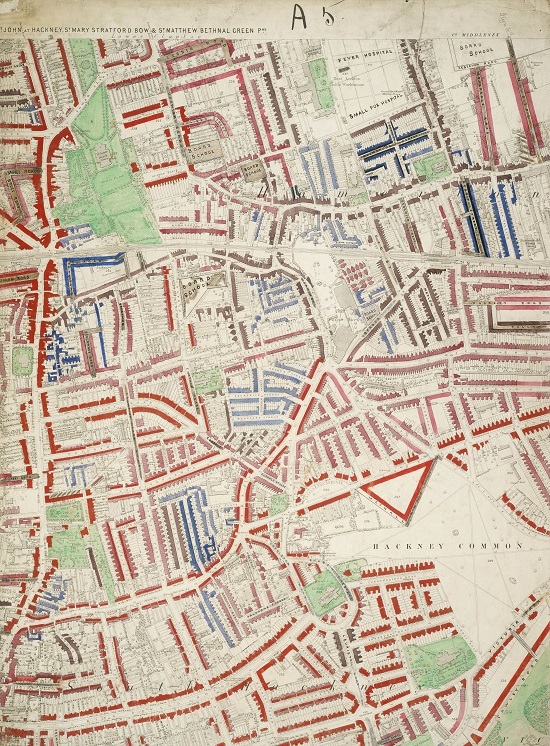 This map of London is colour-coded depending on the affluence of the area, compiled and hand-coloured by Charles Booth and assistants. The districts covered in this section are Clapton and Homerton. • Imagine you live in Victorian London and you see this map. You trace the lines of the streets with your finger – what streets do you recognise? What sights, sounds and smells does it invoke? • Imagine the people who live in these streets. What might their interactions be like? How might they differ from each other? Do some interactions surprise you, or make you rethink stereotypes? 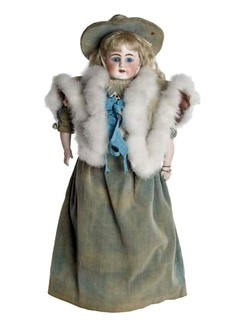 This doll, with a turquoise velvet dress and silk sash and cape, was given to the donor in 1895 when she was 7 years old and dressed by her grandmother. • Imagine holding this doll. How does the cloth of this doll feel? Is the doll heavy? Light? • Would you be rich or poor if you owned this doll? Imagine you are used to improvising toys from the house or streets and you have the chance to play with it for a day – how does it make you feel? 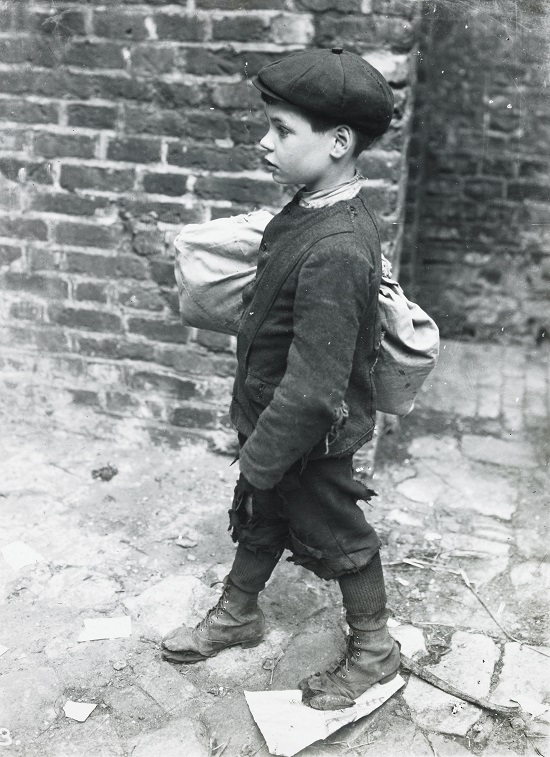 At the top of this page is a photograph of a small boy returning with a bundle from a pawn brokers. Pawn brokers were businesses where household items could be ‘pawned’ for a loan and within a certain amount of time the pawner could buy it back for the same price plus some agreed-upon amount for interest. If the loan was not paid, the pawned item was offered for sale by the pawnbroker. • Look carefully at this boy’s outfit. How does it feel to wear these clothes? What do the streets feel like under his feet? • Imagine you are the photographer. What makes you want to capture this moment? Does the boy keep moving or does he pose for you? Seven cabs, hansoms and ‘growlers’ are shown in the foreground, with a cab shelter behind on the left. 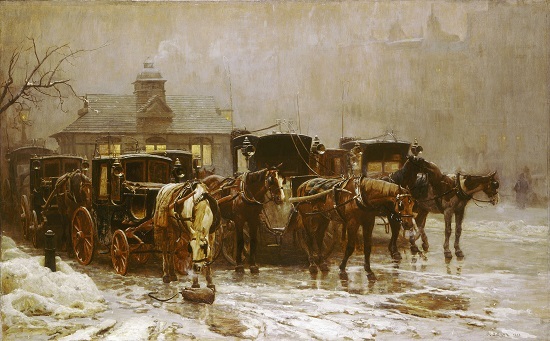 The weather is wintry, with snow and slush on the ground (heavy snowstorms were reported in many parts of England in February 1888). The (usually) anonymous cab-driver was able to move freely around London without being challenged, so the covered carriage was perfect for assignations and secret meetings. Sherlock and Dr Watson often hailed hansom cabs to carry them on their adventures. This magnificent painting (it is nearly 2m high and over 2m wide) is currently on display in the Museum of London’s current temporary exhibition, Sherlock Holmes: The man who never lived and will never die. There are more details at the end of this article. • Imagine you’re a hansom cab driver, stopping off at the shelter for a break. You have to rub your hands and stamp your feet to keep warm, and there is muddy slush everywhere. What are your thoughts? Is it a busy night for cabs, or a slow one? What conversations have you overheard? • Think about the title of this painting. Why do you think it is called ‘Les Miserables’? How does it make you feel to look at it? This oil painting was done while Firth was working on a larger masterpiece called ‘Derby Day’. “As a stopgap,” he wrote in his autobiography, “I began to paint a small picture of a lady waiting to cross a street, with a little boy crossing-sweeper besieging her in the usual fashion.” Crossing sweepers cleared a path ahead of people crossing dirty urban streets in exchange for money; it was a common job among the poor. 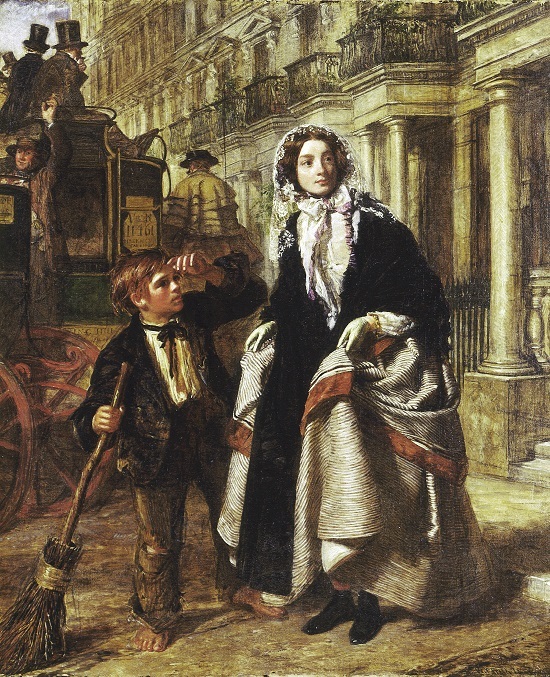 The character Jo in Charles Dickens’ Bleak House was a crossing sweeper. • Imagine you are wearing the outfit of the lady. Is it heavy? Light? Warm? Soft? What about the shoes? How does it make you feel? Now imagine the crossing sweeper’s outfit and ask the same questions. • Imagine you are a crossing sweeper earning a living with your broom. Now imagine that broom is taken away from you. How does that make you feel? Get inspired further by seeing the real thing up close. All these objects are on display at the Museum of London, which is free and open from 10am to 6pm every day. Even better, you can experience the pulse of Sherlock’s London yourself, while wandering through a reconstructed Victorian Walk: full of original shop frontages and goods, it takes you back a hundred years in time to do a little window shopping. Close your eyes and listen to the sounds of a barrel organ, horses travelling, and the cries of street sellers going about their business. Could this be what Sherlock heard as he dashed across the cobbles in pursuit of a criminal? The Museum of London has free Victorian-themed activities from 28 March – 12 April, and a charging temporary exhibition (free for under 12s) all about Sherlock Holmes himself, open until 12 April. Find out more at www.museumoflondon.org.uk. Winners will receive publication, some prizes from the Museum of London shop and an exclusive Young Poets network notebook. This challenge is now closed. You can read the wonderful winning and commended poems by following the links on the top right hand side of this page. I believe that there should be poetry competitions that invokethe beauty of emotion inside us and may be philosopjical. This topic may undoubtedly help to win a prize but it does not insigate the poetic beauty winthin us. These poems are of no use in the future fro that is where we live. Hi Ayesha, we don’t think any of our themes exclude writing about emotions and philosophy and poetic beauty – see if you can join the two things together! Can we write based upon the modern Sherlock series by BBC Britain? Hi Mae, yes that’s ok! May we use a few direct quotes from the books/film adaptations in our poems, or is this not allowed? Can we write about Moriarty or does it have to just be Holmes? I have a poem based more around the villain and his effect on the people around him and Holmes himself. Hi Niamh, sorry didn’t see this in time as it was the weekend but Moriarty would be fine! Hi Ilhem, we will let everyone know within the next 2 or 3 weeks.